For a moment, think about what resistance looks like from the electrons’ point of view. Imagine you are an electron being pushed from atom to atom from the pressure of all your fellow electrons pushing on you. Think about your electron self, moving through the mix of glue binder to carbon particles, where you could either collide with an atom and be given off as heat in the form of atomic vibrations, or at other times, you are allowed to pass through the resistor to continue your path through the circuit. It would stand to reason that if you had a certain pressure of electron friends pushing on you, lets say 9 volts (V or E) worth, and a certain amperage (I) working its way through the resistor of a given resistance, that your movement as an electron would be based on the relationship of all your pushy electron friends. Georg Ohm (1789-- 1854) defined an important relationship between voltage, current, and resistance, now called Ohm’s law which states: a potential difference of one volt will force a current of one ampere through a resistance of one ohm. Mathematically, Ohm's law can be written as: I = E/R, where I refers to the current, E is applied voltage, and R is the resistance in ohms. It can also be written as E = I ´ R or R = E/I. The diagram below allows you to easily memorize this important law. By putting your finger on the value you are trying to solve, you will see the solution. So by putting your finger on the E, you solve for I and R or E = I x R or solving for I would be I = E divided by R.
To understand Ohm’s law and the relationship between voltage, resistance, and current flow, the water analogy is one way to think about this relationship. (directly below). Visualization of electron flow with a resistor as faucet analogy. More resistance means less electron flow. The liquid flow decreases when the faucet is closed. This is analogous to high-value resistance constricting the width of the electron pipe, so fewer electrons pass in a given period. 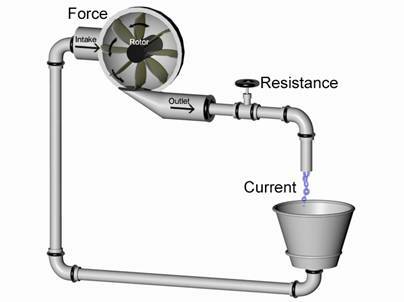 Therefore, high resistance decreases the flow of electrons, but the water analogy also allows identification of the idea of electron pressure or electron quantity as it relates to the possible flow. With Ohm’s law, you can now calculate what size resistor you will need to protect a sensitive electronic part that is not able to withstand large quantities of electrons in a given period of time. Remember how we defined a fuse as a thin wire that would burn up and melt if too many electrons are being pushed through in a given period of time? Well, resistors can prevent sensitive parts from burning up by absorbing and giving off as heat some of that electron energy. With Ohms law, if you are given any two values in a circuit, you can always solve for the third value using simple algebra. Often when you purchase parts the data sheet on the back of the package will say that the electronic device will work with a certain voltage like 5-volts DC. The package will also say that the electronic part only can withstand a certain amount of amperage or milliamperage. With Ohm’s law, you can now calculate that a resistor of a particular size will allow a 5-volt source to deliver a certain amount of amperage in one second of time. Fortunately, Ohm’s law works for AC, DC, and radio frequencies (RF). When working with electronics, it is important that we have a language to communicate electronic designs. The excitement of being able to read the maps will become apparent as you learn electronics since maps of possible circuits are freely available. A schematic is a map that tells us how to build circuits. They are constructed of symbols, which refer to different electronic parts. When I first started studying electronics it was intimidating until I realized that artists and engineers are visual thinkers and can see things three dimensionally, however, engineers have also constructed a marvelous symbolic language to describe circuits and their connections, and this language also makes a lot of sense to artists. For example, (image below) shows the symbol for the resistor and a 3D model of a resistor to the right. The crooked line communicates that as the electrons enter the resistor they are reduced in quantity or slowed down, as in a crooked road that may slow your car down. You can also think of the resistor symbols, crooked line, as a wave of heat which is the resistor getting hot with all the quantum vibrations of electrons striking the nuclei of the carbon atoms within the resistor. 470-ohm resistor: part on right and schematic drawing on left. Following this paragraph is an example of a schematic that has a resistor, a lamp and a battery in a complete circuit. We will use this circuit schematic and some changing values to do some Ohm’s law calculations.